ModuTile’s interlocking floor tiles are often installed in garages. The tiles can withstand the weight of heavy vehicles and other heavy equipment such as tool boxes or cabinets. When designing your new garage floor, we recommend that you review the following information before deciding on your final design layout. Once you are ready to buy, visit our garage flooring section to see all our garage floor tile options. When installing your garage floor, we highly recommend that you install ramp edges on the entrance of the garage. Remember, that you will be opening your garage doors and without the edges, the room will look unfinished. In addition, the ramp edges serve as a bridge for your tires to move from the concrete to the garage floor. When the ramp edges are used, your floor will tend to shift much less, minimizing the need for future adjustments.We always recommend that all DIY garage floor installers begin the installation from the entrance of the garage. The primary reason is to allow you to easily place the first row at the exact place you want the ramp edges and the garage tiles to be. Remember that the entrance of the garage needs to look the best as it is the first area you will see when entering the garage. A common question we get goes as follows: So why can’t I install the ramp edges last? The answer is that nothing prevents you from installing the edges last. However, special consideration should be given to what type of edges you choose. We make ramp edges with loops and ramp edges with NO loops (pegs). When you start your installation at the back of the garage, you will end up needing ramp edges with NO loops. Also, when you start your installation from the back of the garage, you may need to shift the entire floor because you cannot cut tiles at the entrance of the garage. If were to cut the tiles at the entrance of your garage, you would not be able to use the edges because you would be cutting the tiles’ locking mechanism. Because of potential mishaps that can occur when beginning the installation in the back of the garage, we always recommend that our customers begin the installation at the entrance of the garage. If you do, you will need to buy the ramp edges with loops. I assure you that for first time installers, this method will be much simpler and less likely to result in any mistakes. Most garages do not have exact round number dimensions. In other words, they tend to measure “X” ft. and “X” inches. In many cases, the garage itself has one width dimension on the entrance of the garage and another on the back of the garage. What this means to you is that you will have to cut along one or two walls to finish the sides. Remember that our garage floor tile measure 12 by 12 inches. So what does Centering the Room mean? It is basically the method to locate the center of the room. In this case you are finding the center of the garage. Because you will need ramp edges at the entrance of the garage, you only need to find the center line splitting the garage in two (from side to side) as illustrated on Figure-1. Of course, if you only want to cut along one wall, then this technique is not needed. All you would need to do is start the installation at one of the corners nearest the entrance of the garage. Please be aware if you do not center the room, the pattern you choose may look unfinished or incomplete. 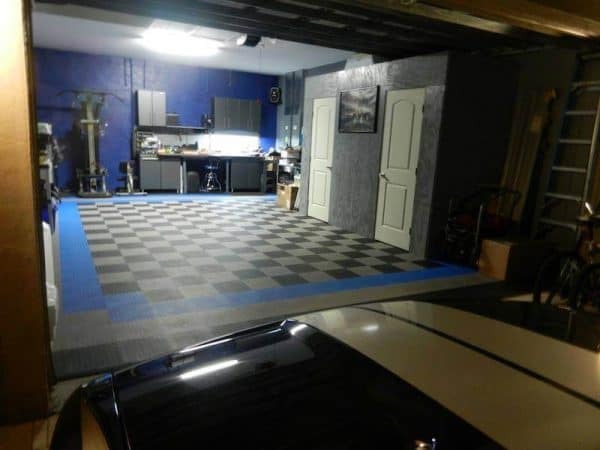 Please review our article called Popular Interlocking Garage Floor Design Layouts and look at the Double Checkered example to better understand what we mean about unfinished pattern. 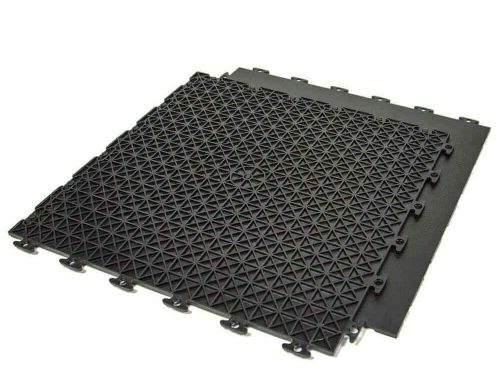 If your garage has drainage, it is recommended that you use our drain tiles on the portion directly above the drain. This will allow any water that enters your garage to drain easier. 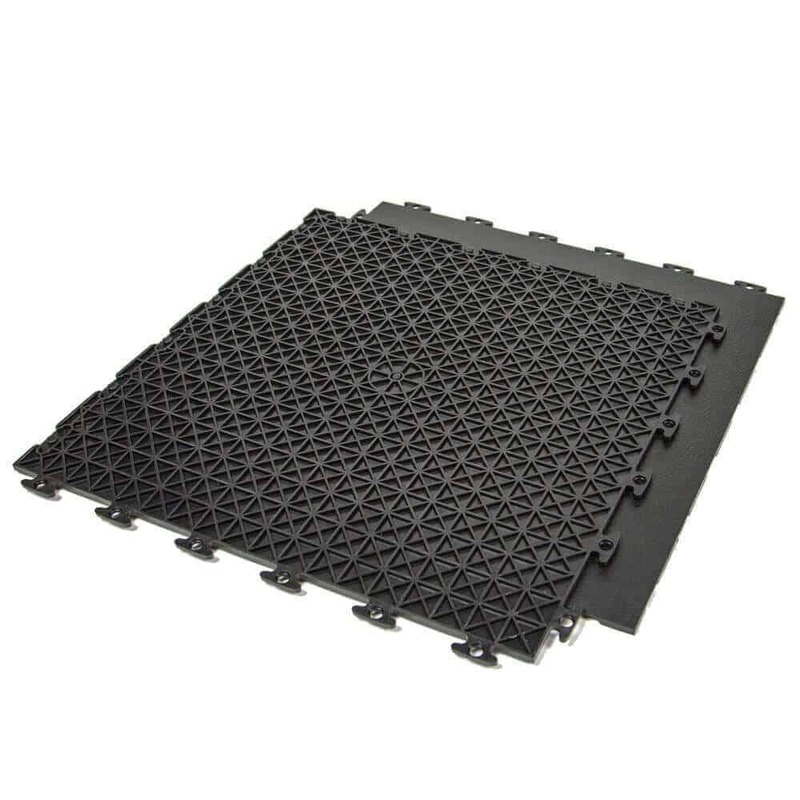 You can also use our drain tiles for your entire garage flooring. The advantage of using the drain tiles for the entire garage is that the floor will look cleaner. The disadvantage is that when you do clean, it may take longer as you will need to use a shop vacuum and in many cases a power washer. This is a good option for many people leaving in northern states where snow is common. Customers who are unhappy with epoxy floor paint often turn to garage floor tiles. Epoxy paint will tend to come up if it is not installed properly or if an inappropriate type of epoxy paint is used, especially when the concrete floor is old and stained with oil. There are many different qualities of epoxy paint, and they are not all created equally. In a typical installation, it is very hard to maintain the bond between the epoxy floor paint and the concrete. The result is separation of the epoxy paint from the concrete when large amount of pressure is applied. Over time, epoxy will look like it is peeling off from the concrete. When you are installing our garage floor tiles over epoxy floor paint, the floor tends to be smooth and slippery. Because of this, we recommend the use of double sided tape. By doing so, you will create more friction between the smooth epoxy floor underneath and the garage floor tiles above. Essentially, it will prevent the tiles from sliding. Note that you do not need to put double sided tape on every garage floor tile. You can usually place a few strategically placed large “X’s” on the floor. In some cases, parallel lines running from the back of the garage to entrance is more appropriate as it will allow the water to flow out of the garage easier. If you have a drain in the garage, make sure the double sided tape does not create water retaining walls that would prevent the water from draining properly. When you plan to have a car lift inside your garage, we recommend for you to install the lift first and then the garage floor. This will allow your lift installers to secure the car lift directly to the concrete making the installation much more secure. When you do install the garage floor tiles, you would cut the tiles to fit around the posts. In many large garages, you will also find posts or columns. When this is the case, you should also cut the garage floor tiles to fit. You can install the entire garage first and cut the garage tiles to fit around the posts at the end of the installation. For advanced installers, you can cut during the installation as you reached the obstacle. Since you are installing one row at a time, it would be easier for you to cut the tile and install prior to continuing to the next row. The disadvantage is that you would not be able to shift the floor as the obstacles would prevent you from doing so. If the Garage Floor has a Step? Many garages have a concrete area that separate the main parking floor to the rest of the garage. In these situations, we recommend for you to use the garage floor tiles for the main parking area and then use epoxy floor paint for the rest. The garage floor tiles are rigid and would not conform to a step. Remember, that your car will not be driven up the step so the epoxy floor paint would not peal off easily. Many jacks tend to have very sharp edges around the base of the jack. When using the jack to lift a vehicle, there may be too much stress on a small section of the tile. We recommend that you place plywood between the jack and the garage flooring so that stress marks are not formed. Using this technique will best preserve your garage floor tiles. Purpose of this page: This article applies to all interlocking floor tiles with our loop to peg system. It is a basic introduction of how to interlock the tiles together. Interlocking the tiles together is as simple as aligning the tiles correctly and snapping them together with your hand or mallet. Aligning the Interlocking Floor Tiles is important. Remember that these interlocking tiles are modular in nature, so they can connect even if they are aligned incorrectly. Please see image to review a basic diagram on how to align the tiles. If you notice on the correct tile alignment, the loops are all facing the same direction. Make sure you align the pegs and loops correctly as this will allow them to snap together much easier. Warning: There is a possibility of damaging the pegs and loops if you bang them with a mallet when the loops are not properly aligned. Do I need any tools to interlock these tiles together? No, it is possible to interlock them with your bare hands. However, since many of you are installing large areas, we would recommend that you use gloves, knee pads, and a small mallet. I will assure you that your knees and hands would appreciate it. Visit our Interlocking Floor Tiles section to view our most popular products. Note: Please note that this article does not cover a room installation. 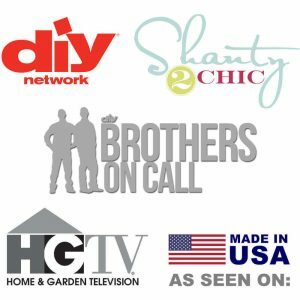 Depending on your particular project, the installation recommendations could differ. Please find the installation article that is most closely associated with your particular project. Below, we have listed some direct links to specific project types. Below we will show five examples of the most popular design choices when using our single color interlocking floor tiles. Please note that different rooms will have unique design needs. We recommend that you visit our room-by-room explanation of what you should consider before choosing your design or starting installation. We hope that some of these designs will inspire you to make your basement flooring or garage flooring special. Below are the five design layouts that we will cover in this article. This is by far the most popular design that our customers install. Although the most popular color combination is black and gray, you can use various color combinations to match a theme of your choice. To illustrate the design, we have chosen a popular room size of 20 ft. by 20 ft. In this room size, you can lay out the pattern starting from any corner and it will lay out perfectly. As illustrated on Figure-1A, the pattern will cycle 10 times in either direction. However, if you have a 19 ft. by 19 ft. room, things change. If you start the installation process from the corner of the room, you would end up with half of a row. The pattern would cycle 9 ½ times leaving two perpendicular rows with a half finished pattern that does not look good. Refer to Figure-1B to see the half finished rows. If you still want this design layout, don’t panic because it can still be done. However, the installation process would involve cutting on four sides of the room. The reason is that you cannot start laying out the tiles from a corner of a room. In this example, you would need to locate the center point of the room and create proper starting lines. To learn to do this, please go to our article called “Basement Flooring: Installation”. There we give an explanation of the process of figuring out centerlines and drawing the starting lines for proper installation. Basically, with this method, you will have to cut the tiles to fit around all four walls. On Figure-1C, you can see an example of how the layout would look if you were to use the Center Line installation procedure. If you are installing this layout in a garage floor, please consider that once you cut the tiles, the edges will no longer interlock with the tiles. This layout is also very popular, and when used appropriately, the room can look classy and upscale. On the single checkered layout, you would layout the tiles by alternating each color after every tile. In rooms larger than 18 x 18, this pattern sometimes does not look as good. The tile alternate colors too often making it feel crowded. If this were the case, I would recommend that you move up to the double-checkered design. Of course, this is completely subjective and some people just love the race flag look. 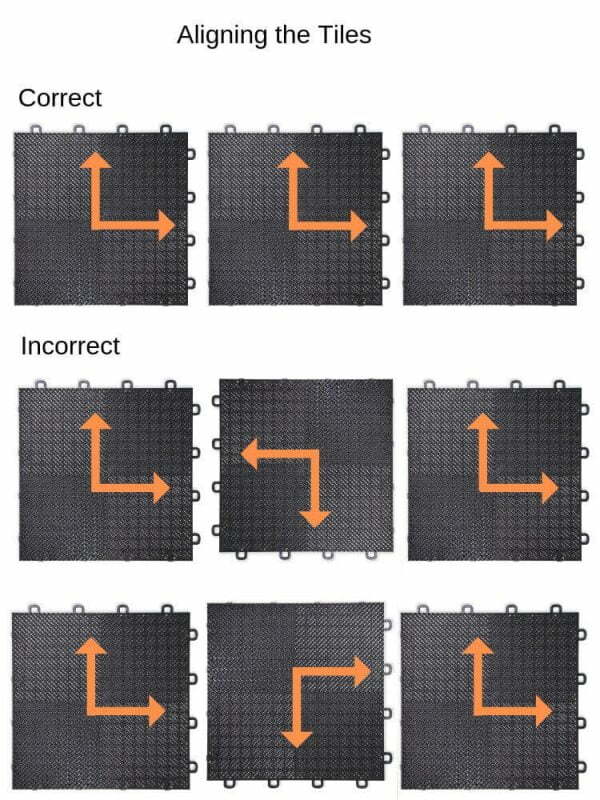 Figure-2 illustrates the single checkered layout in a garage floor. The major benefit of this design layout is that you seldom run into the installation problems. The reason being that colors alternate one tile at a time rather than every 2 tiles as in the Double Checkered layout. Of course, if your room happens to be 12 ft. 5 inches long, then you would have to cut in at least one wall. Fortunately, because the pattern is much closer together you can cut the last row and the overall look of the room will still look good. There are some very nice variations of the single checkered design with borders. The simplest way to do this is by making a single border in the outer layers of the room (see Figure-3A). In our example, we use red, but other colors can certainly be used. I have seen other variations used successfully. One such example is when you do a single or double border (depending on your room size) one row into the design. This is illustrated on Figure-3B and Figure-3C. The solid color installations are the most basic design layout you can make. Sometimes, the room wall décor, or the furniture in a basement, or the car in a garage can make this installation a better choice. With a single color floor, you can change the focus of the room to the wall or to objects around the room. This floor design can sometimes add a little color to the floor without changing the focus of the room. It a simple installation and can certainly be done with success. Below are three examples of how the border can vary. My examples as illustrated on Figure-4(A-C) use yellow, black and red to give it a feeling of framing the floor. However, other colors can certainly be used successfully.